“The United States, and by affiliation Louisiana, have benefited in innumerable ways from our deep friendship with Israel. Any effort to boycott Israel is an affront to this longstanding relationship. I am pleased that Louisiana will join what is now a critical mass of states in supporting our closest ally,” Edwards said in a statement. Louisiana Democratic Gov. John Bel Edwards issued an executive order on Tuesday prohibiting his state government from doing business with companies that boycott Israel. The order directs the state commissioner of administration to terminate existing state contracts with companies if they are currently boycotting Israel or supporting those who do. In the future, companies will be required to certify that they are not boycotting Israel before being awarded a state contract. The prohibition does not impact speech or consumer conduct. It is limited solely to commercial conduct only and will not be applied to companies that have contracts with the state that total less than $100,000 or that have fewer than five employees, according to the executive order. 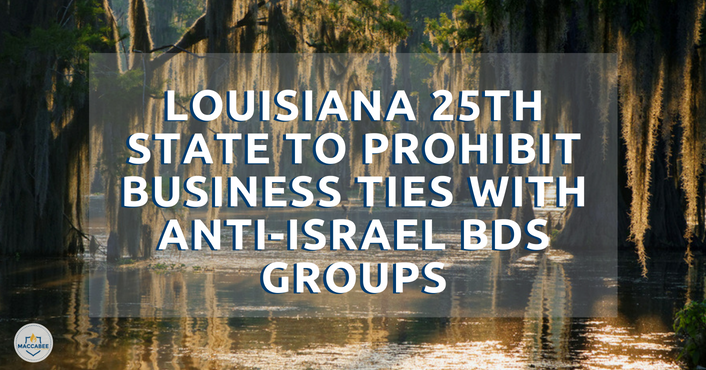 Pro-Israel groups quickly congratulated Edwards, whose state became the 25th to prohibit business with BDS groups.